I wrote this article for the CMS Publishing partwork “An Adventure in Space & Time.” I wrote it in 1986 about a story I’d watched on TV in 1972 when I was at primary school. That was a 14 year difference, by which time I was at university. So I am republishing it here on my blog after a gap almost twice as long as that. This was the first thing that publisher Jeremy Bentham ever commissioned from me. Subsequently, I learned that he’d used it as a sort of “audition piece” for the work I later did on the CMS partwork “In-Vision” which I edited with Justin Richards from 1988. I find it interesting to read something I wrote half a lifetime ago. I’ve not changed the wording, so it still contains some inelegant phrasing that I’d now avoid. I wish I’d provided detailed references to my source material – for example, where my research revealed the mechanics of early videotape edits, or even the book in which I read the essay from which I quote David Hare. However, that wasn’t the house style for CMS at the time. And of course the world of TV production – funding, scheduling, transmission, technology and so on – has utterly changed since 1986, let along since “Carnival of Monsters” was made over forty years ago. This is therefore a period piece, and perhaps that’s appropriate for the 50th anniversary year for Doctor Who. Doctor Who has from the beginning been made in electronic television studios, which is the traditional production methos for BBC drama programmes. The “ground rules” for drama production – as for all other types of television production – were established at the Alexandra Palace studios in the 1930s. Subsequent moves to the Lime Grove and Riverdale studios, and then to the Television Centre at White City in the 1960s, improved the facilities available but had little bearing on the way in which programmes were actually made. The advantages of studio production are bound up in the cost-effectiveness of heavy investment in permanent resources. Large multi-camera studios are worked for six and a half days a week, with half a day for maintenance. In 1972, when “Carnival of Monsters” was made, it was possible to produce thirty minutes of programme per day, the same as had been achieved in the early black-and-white years of television. This is more than twice the amount of film produced on an average say’s film shoot. 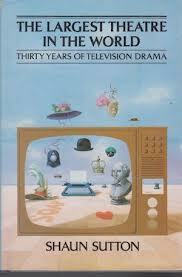 However, location recording for drama was required fairly early on in television’s history, led particularly by children’s drama productions. As Shaun Sutton observed in The Largest Theatre in the World [BBC, 1982] youthful adventure scripts required fights, chases and outdoor movement. With early outside broadcast television cameras limited by the length of cable from Alexandra palace, it was logical to make use of established film technology to provide short sequences for insertion into drama programmes being broadcast live. The use of such film inserts not only gave greater flexibility and realism than false perspective sets or filmic back projection, it also allowed the next scene to be set up in the studio while the insert was running (a production breather, in effect). Even when technological advances made it possible to pre-record sequences or whole programmes on videotape, film still had the advantage of being much easier to edit. At first, the only way videotape could be edited was by physically cutting the tape with a razor blade then splicing it together again, the whole operation carried out by an experienced editor peering through a magnifying glass. Each edit took approximately ten minutes to perform and rendered the tape unsuitable for later reuse. By the mid-Sixties, when electronic videotape editing became available, film was already well-established as the preference for exteriors in drama; indeed, the “realistic” drama of BBC programmes such as The Wednesday Play (later Play for Today) was celebrated for tackling issues in the film medium, achieving not only a more natural performance but also a greater freedom for programme makers from in-production observation by potentially censorious executive personnel. Television OB had been demonstrated as popular for live current affairs and sports programmes, but early attempts at drama OB were hampered by the OB units’ “house style” for covering live events, which depended to a greater extent on the initiative of the cameraman and less on the scripting of a writer and director. Film and video were thus being used together in television drama fairly extensively by the time “Carnival of Monsters” was made. However, the two media look very different on screen, as can be seen when the Doctor and Jo move from the deck of the SS Bernice (film) into the cabins (studio) or from the Drashig’s domain (film) into the cave (studio). This can be accounted for by the fundamental differences between film and video and the different ways in which they are used during production. Film is the recording of images on a one-off basis by chemical and mechanical means; video is the electronic registration of images onto magnetic tape. Film sound is recorded separately from the pictorial image and dubbed on later; studio sound is recorded on the videotape along with the image. Film has traditionally been single-camera, with each framed shot being lit separately according to what that image has to say when edited into the complete sequence; video, most obviously in the studio, is multi-camera, and a set is lit so as to allow the recording of a sequence of shots from several cameras whose pictures are selected and edited as live by the vision-mixer (and during this process there is the continual need to avoid shooting off the edge of the set or allowing in sound booms or their shadows). Location filming is traditionally completed before the studio work (following the Hollywood precedent), and to an extent defines the later performances. Studio performances are more continuous, and time is at more of a premium when it comes to the consideration of second takes, particularly if there is an effects sequence to be achieved live. Film has problems which cannot be so readily spotted as video, inflexibilities, which are part of the filmic process: print “sparkle,” black lines and obstructions in the film gate can be discovered only when the “rushes” have been developed. Studio tape, however, can be replayed at once, even to check continuity. Furthermore, tape accepts degrees of light that film will not, and a studio is a far more controllable environment than a location: Britain, after al, does not have a climate, it only has weather. The particular differences in 1972 were also bound up with the growth of colour television. Whereas film had been working in colour since before television’s birth, the BBC had been making colour programmes on a regular basis only since 1969. 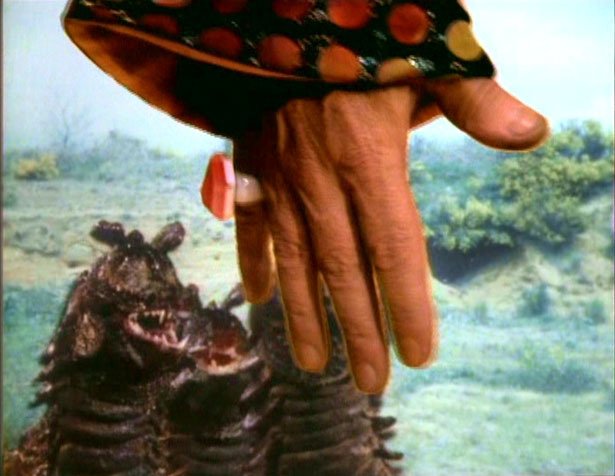 One consequence of the introduction of colour to Doctor Who was that black-and-white Overlay effects could be dropped in favour of three-colour CSO – a technique much in evidence in “Carnival of Monsters.” This meant that there was no longer any need for sharp brightness contrasts in video effects shots; instead, sharp colour contrasts were required. John Logie Baird had first demonstrated large-screen colour television in low definition in 1928, and the post-war BBC experimental television group had made use of the defunct Studio A in Alexandra palace for experimental transmissions after closedown in 1955. America’s CBS had adopted the 525-line NTSC colour system in 1953, and this was to form the basis of Britain’s 625-ine PAL system of 1966. the constraint in Britain was that the Television Advisory Committee had required any colour system to be available also in black and white on existing monochrome sets. And when colour drama was first transmitted, the “stale overlit shells” were flooded with the light required for PAL recording, such that the mostly-overhead studio lights produced a comparatively “flat” image, albeit in a variety of garish colours (especially in historical costume drama). Location film was able to draw upon a longer tradition of colour lighting and shot composition, and the contrast between studio and film images was understandably more stark than it had been before. This is most apparent in “Carnival of Monsters” where there is a simultaneous image comparison: Vorg’s hand on video) swatting the Drashig’s (on film) is a good example of this, as is the film plesiosaurus viewed from the studio cabin. As colour television techniques developed and video recording equipment became more refined, the difference in discernible picture quality between the sharp accuracy and “presence” of video and the subtler, “atmospheric” potential of film would become smaller. It is the starkness of video lighting which reveals the greay bald-wigs of the Inter Minorians so obviously in “Carnival of Monsters,” while the detail on the Doctor’s jacket or the character Claire’s dress is less noticeable on film than in the studio. However, Doctor Who would continue in the Pertwee years to make use of film mainly for traditional purposes: effects shots and exteriors which were too difficult or to expensive to achieve in a controlled studio environment.